Amitriptyline hydrochloride is a medication that is used in treating depression. It constitutes a class of drug known as tricyclic depressants (or TCAs). Amitriptyline Hydrochloride Overdose is the accidental or intentional intake of the drug, in dosage higher than the recommended/prescribed value. What is Amitriptyline Hydrochloride Overdose? What are the Causes of Amitriptyline Hydrochloride Overdose? What are the Signs and Symptoms of Amitriptyline Hydrochloride Overdose? The signs and symptoms of Amitriptyline Hydrochloride Overdose can vary from one individual to another. It may be mild in some and severe in others. Several systems of the body, such as the digestive system, nervous system, vascular system, respiratory system, and ENT may be affected. How is First Aid administered for Amitriptyline Hydrochloride Overdose? Who should administer First Aid for Amitriptyline Hydrochloride Overdose? 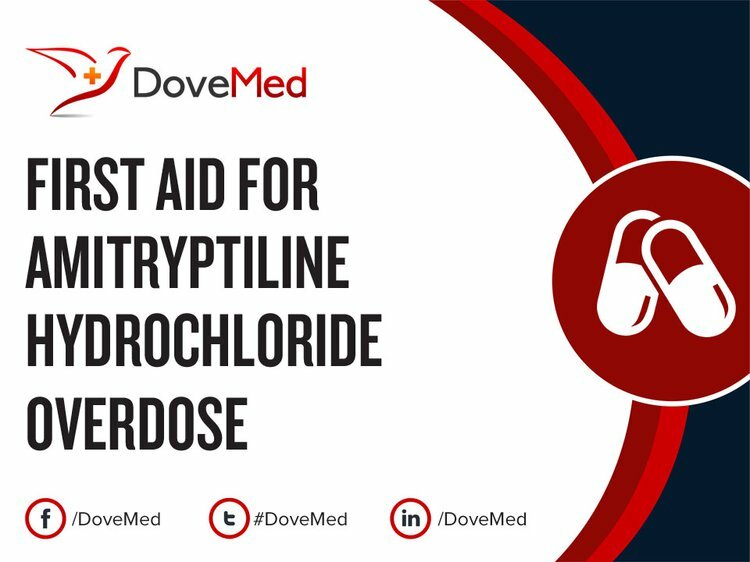 First aid for Amitriptyline Hydrochloride Overdose is administered by healthcare professionals. What is the Prognosis of Amitriptyline Hydrochloride Overdose? How can Amitriptyline Hydrochloride Overdose be Prevented? Patel, D., & Patel, V. (2010). Simultaneous estimation of amitriptyline hydrochloride and perphenazine by absorption ratio (q-analysis) UV spectrophotometric method in combined tablet dosage form. Int J Pharm Sci Res, 1, 133-137. Elmasry, M. S., Blagbrough, I. S., Rowan, M. G., Saleh, H. M., Kheir, A. A., & Rogers, P. J. (2011). Quantitative HPLC analysis of mebeverine, mesalazine, sulphasalazine and dispersible aspirin stored in a Venalink monitored dosage system with co-prescribed medicines. Journal of pharmaceutical and biomedical analysis, 54(4), 646-652. Khan, F., Sheikh, M. S., Rub, M. A., Azum, N., & Asiri, A. M. (2016). Antidepressant drug amitriptyline hydrochloride (AMT) interaction with anionic surfactant sodium dodecyl sulfate in aqueous/brine/urea solutions at different temperatures. Journal of Molecular Liquids, 222, 1020-1030. Strauch, S., Jantratid, E., Dressman, J. B., Junginger, H. E., Kopp, S., Midha, K. K., ... & Barends, D. M. (2011). Biowaiver monographs for immediate release solid oral dosage forms: mefloquine hydrochloride. Journal of pharmaceutical sciences, 100(1), 11-21. Ali, M. S., Rub, M. A., Khan, F., & Al-Lohedan, H. A. (2012). Interaction of amphiphilic drug amitriptyline hydrochloride with β-cyclodextrin as studied by conductometry, surface tensiometry and viscometry. Journal of Molecular Liquids, 167, 115-118. Shen, Y., Zhu, R. H., Liu, Y. W., & Xu, P. (2010). Validated LC–MS (ESI) assay for the simultaneous determination of amitriptyline and its metabolite nortriptyline in rat plasma: Application to a pharmacokinetic comparison. Journal of pharmaceutical and biomedical analysis, 53(3), 735-739. Jantratid, E., Strauch, S., Becker, C., Dressman, J. B., Amidon, G. L., Junginger, H. E., ... & Barends, D. M. (2010). Biowaiver monographs for immediate release solid oral dosage forms: Doxycycline hyclate. Journal of pharmaceutical sciences, 99(4), 1639-1653. Deepakumari, H. N., Prashanth, M. K., & Revanasiddappa, H. D. (2013). Validated and sensitive spectrophotometric method for the determination of amitriptyline hydrochloride. Chemical Sciences Journal, 4(2), 1.